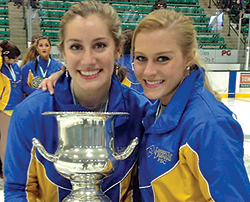 SPORTS | Two University of Delaware figure skating alumnae have taken their talents to the next level by signing on with the world’s top touring ice extravaganzas. Julianne DiMura, AS13, has joined the cast of Platinum, the 70th anniversary show of Stage Entertainment’s Holiday on Ice. Megan Marschall, AS13, will skate in Princesses and Heroes, a Feld Entertainment Disney on Ice presentation. Four-year skating veterans at UD, DiMura and Marschall were members of the University’s Collegiate Figure Skating teams that took national championships in 2011 and 2013. The team won its most recent championship in an April competition at Dartmouth College in Hanover, N.H., marking the second time in three years that UD earned the national title. The UD team scored 98 points, while defending champion Dartmouth College finished second with 93 points and Boston University third with 84 points. The Platinum tour runs though May 2014, with performances in the Netherlands, Germany and France. With performances slated for the U.S. and Canada, followed by shows in Dubai and Qatar, Princesses and Heroes runs until late May 2014. For all the latest UD athletic news, visit www.bluehens.com.